One of my objectives in visiting the Douro is to define the style of each Port House. Some are more distinct than others, of course. At Taylor Fladgate yesterday morning, Croft seemed to have the most overt style, Fonseca was generous as always, and Taylor was the most refined and precise. Then in the afternoon, Churchill showed a characteristic thread of acidity, sometimes verging on minerality, always precise, through both tawnies and rubies. Today I spent the morning at Ramos Pinto with Ana Rosas, the fifth generation of the family to be involved in winemaking, who has recently taken over as their master blender. 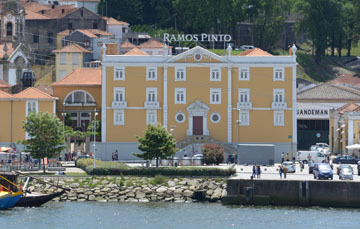 Ramos Pinto has long been known for the quality of their tawny ports. “Tawny really is the soul of Port, it’s what the house is about, it’s how we have learned to age the wines, it’s the style of the house,” says Ana. Defining style was a challenge as the ten year aged tawny comes from their vineyard in Douro Superior, Quinta de Ervamoira (near Foz Coa), while the twenty year tawny comes from Bom Retiro in Cima Corgo. The ten year shows all the power of the Douro Superior, the hottest and driest part of the region; in fact, the average age is between 12 and 13 years because the wines are initially so intensely colored that they take longer then ten years for the color to attenuate to the point at which the wine can be approved for tawny port. It’s still quite dark for a tawny. The twenty year was my favorite in the tasting, expressing the full delicacy and nuance of the aged tawny style. We are also tasted some of the wines that are blended into it, some very old and concentrated (like the 1924 and 1964) so that only very small amounts are used. How many different lots are blended, I asked Ana. 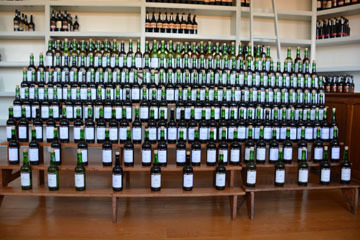 “I really don’t know,” she said, “it’s too many to count and the amounts that are used vary widely.” In the tasting room, there’s a large array of small bottles with samples of wines for blending. Ana calls this her piano. The 30-year tawny shows more concentration and intensity than the 10-year or 20-year, with a style that’s between them in terms of the balance between power and elegance, as it’s a blend from both Ervamoira and Bom Retiro and other vineyards (all owned by Ramos Pinto, who use only estate grapes). Ramos Pinto do not usually produce a 40-year tawny (you might certainly feel that the 30-year takes the style as far as it can go) but exceptionally there is presently a 40-year tawny, made in tiny amounts as a celebration, which shows the style of the 20-year taken to an even higher level of concentration. So I may have failed in my basic objective of defining style, but I’m happy to say that in effect there’s a style for everyone here: 10-year or perhaps 30-year if you like some forcefulness, and 20-year if you prize delicacy. Light elegant color is a marked contrast with the depth of the 10-year. Very fine elegant impression to nose in quite distinct style. Refined on the palate with a delicate nutty impression, with a lovely balance supported by lacy acidity. Overall an impression of beautiful delicacy. Fine impression to nose, with more intensity but less delicacy than the 20-year. Lots of concentration and flavor, but maintains freshness, with a lingering, sweet, nutty aftertaste. We also tasted some old vintage Ports, going back from 2000 to 1924. My favorite was the 1963. Very soft on palate, lightening in color and aroma, you might say the spectrum is part way to tawny. Very fine and just a touch spirity as it develops. The Ramos Pinto Lodge on the waterfront at Gaia.